Sometimes when I meet new people, I feel like I have seen them before. Their faces might look similar to people's faces, I have really have met before. Prosopagnosia is an inability to identify faces and face-like objects. This represents a failure to encode incoming visual information. Neurological studies indicate that prosopagnosia is associated with bilateral lesions of the central visual system, primarily located in the mesial occipitotemporal region. I don't have problems with identifying faces, I just group them too often. Why do novel faces sometimes look familiar? Is this related to a kind of face-blindness? What is the neural basis for this phenomena? Feeling as though you have seen a face before is perfectly normal. It may reflect actual similarities between the new face and the face you have seen before. There are people who genuinely look like each other, an example being celebrity look-a-likes. It may also reflect a commonly observed cultural/ethnic effect where people of a different ethnicity look more similar (Meissner & Bringham, 2001). In terms of what happens in the brain, besides processing by the basic visual system (LGN, V1), the ventral visual pathway and areas associated with object and face recognition are involved with identifying the face. Particularly, these three core regions show space-specific responses: fusiform gyrus, lateral inferior occipital gyri , and posterior superior temporal sulcus (Haxby et al., 2000; 2001). There is ongoing debate that the fusiform area plays a broader role in that of visual expertise, rather than just face perception (Gaulthier et al., 2000; Xu, 2005). Although less is known about temporal aspects of face processing, this is starting to be the focus of newer studies such as Zheng et al., 2012. I haven't found any known explanation but if you feel that the way you perceive similarity in faces is not normal, then you may be interested in reading about false facial recognition problems following brain damage (*Rapcsak et al., 1996) or (slightly different) misidentification syndromes (Hudson & Grace, 1999; Breen et al., 2000). *Unfortunately I could not access this article to summarize it. Breen, N., Caine, D., Coltheart, M. (2000). Models of face recognition and delusional misidentification: A critical review. Cognitive Neuropsychology. 17(1/2/3):55-71. Gauthier, I., Skudlarski, P., Gore, J. C., Anderson, A. W. (2000). Expertise for cars and birds recruits brain areas involved in face recognition. Nature Neuroscience 3:191-197. Haxby, J. V., Hoffman, E. A., Gobinni M. I. (2000). The distributed neural system for face perception. Trends in Cognitive Science, 4(6):223-233. Haxby, J. V., Hoffman, E. A., Gobinni M. I. (2001). Human neural systems for face recognition and social communication. Biological Psychology, 51(1):59-67. Hudson, A. J., Grace, G. M. (1999). 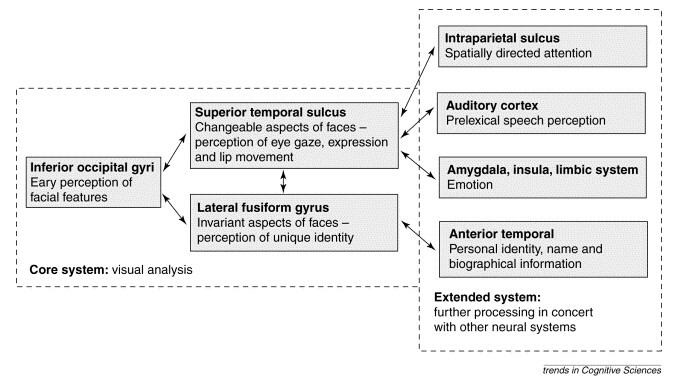 Misidentification syndromes related to face specific area in the fusiform gyrus. J Neurol Neurosurg Psychiatry, 69(5):645-648. Meissner, C. A.; Brigham, J. C. (2001). Thirty years of investigating the own-race bias in memory for faces: A meta-analytic review. Psychology, Public Policy, and Law, 7(1):3-35. Rapcsak S. Z., Polster M. R., Glisky M. L., Comer J. F. False recognition of unfamiliar faces following right hemisphere damage: neuropsychological and anatomical observations. Cortex; a Journal Devoted to the Study of the Nervous System and Behavior. 32(4):593-611. Xu, Yaoda. (2005). Revisiting the role of the fusiform face area in visual expertise. Cereb Cortex. 15(8):1234-1242. Zheng, X., . Mondloch, C. J., Segalowitz, S. J. (2012). The timing of individual face recognition in the brain. Neuropsychologia, 50(7):1451-1461. Not the answer you're looking for? Browse other questions tagged terminology perception autism neurology or ask your own question.